Employee referral rewards are important for a successful Employee Referral program. Employee referrals are proven to be one of the most productive recruiting strategies. Therefore, having a well structured employee referral reward program is extremely important. Use this list of top employee referral reward ideas to encourage your existing employees to refer friends and family for your open job positions. One of the biggest recruiting challenges today is to find the right job candidates. One of the best strategies to overcome this challenge are employee referral programs. Many researches have proven that employee referrals are one of the best ways for finding high-quality new hires. The best explanation is: they know best who your candidate persona is. In other words, they know best who your ideal candidates are. They know what are their characteristics, and they know if your Employee Value Proposition would attract them. Referred employees are proven to take shortest to hire, take least money and resources to hire and are best quality hires. Well structured Employee Referral Programs can really take your recruiting strategy to the next level. Money – it is very important to find a perfect balance because it is not good to offer too much just as if you offer too little. Most of people are driven by financial rewards. Tickets for an event – people love to get things like court side seats of a game, VIP access to a concert that is sold out or movie tickets to a premiere. This gives you a lot of space to simply find out about your employee’s interests and use it to your advantage. Food and drink – never underestimate the power of a good restaurant. Specially if it is impossible to get a reservation there. You can also offer week off breakfast/lunch in your company’s buffet or similar kind of discount. Day(s) off – additional days off are more than a good way to motivate someone to put in the extra effort. Trip – plane/bus/boat tickets for a trip with a family or a girlfriend/boyfriend would be a great benefit for people who love to travel. Relaxation - stress is a number one health problem and people are always searching for a way to relax or blow out some steam. A spa center or gym/personal workout is a good way to go with. Adventure – some people love adrenalin and they want to try new things. Paragliding, hot air balloon, adventure parks, water parks etc. Be creative. Charity – some of the companies are full of people who really care a lot about environment, animals, people in need and other community important issues. Offering the gift cards for different charities or donations is a great way to show appreciation. Social recognition – people love to be recognized as someone who did a great job so give them exactly that! T-shirts, thank you signs, giant check, recognition in the company’s newsletter etc. Department competition – you can make a competition out of it that the best people may win. The department that wins, gets better… something. Why using Employee Referral bonuses and rewards? Employee referral rewards and bonuses are important for a successful employee referral program. Often, there are employees that refer better than others, and their work should be rewarded. It is proven that employees that successfully refer also become more loyal to the company and stay longer. For that reason, employee referrals can be one of your strategies for retaining employees as well. 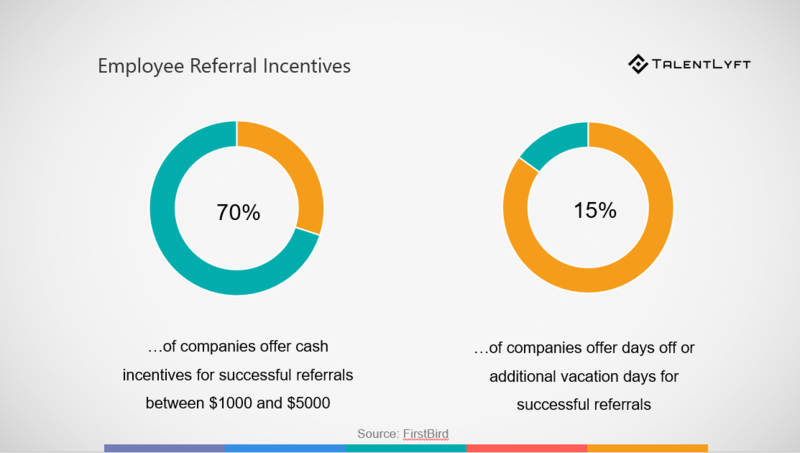 Need more Employee Referral reward ideas? If you need more ideas for employee referral rewards, here is a free list of 50 most popular employee referral rewards. Features of a modern recruitment marketing software offer solutions for more streamlined and automated referral programs. With tools like this, you can organize your employee referral effort, and make it much more productive. Often times, tracking referrals is not easy. It requires a lot of planning and organization. In addition, staying fair in this process is extremely important. 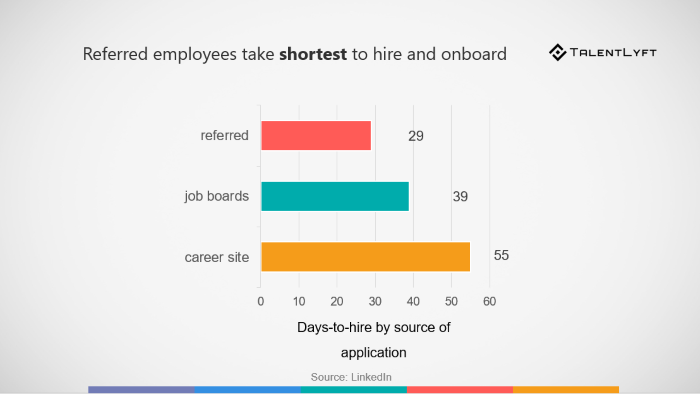 If you would like to see how TalentLyft users use employee referrals through our tool, schedule a call with us.